Mafia Wars players can look forward to Dr. Dre's dulcet tones following them around as they beat up drug runners and rob warehouses. Seminal rapper Dr. Dre has signed a deal with FarmVille creator Zynga to promote his latest album, Detox, within the developer's crime-based Facebook game, Mafia Wars. The video from Dre's latest single, Kush, began streaming within the game on Friday, accompanied by limited edition in-game content, like a "vintage ride" and new weapons. 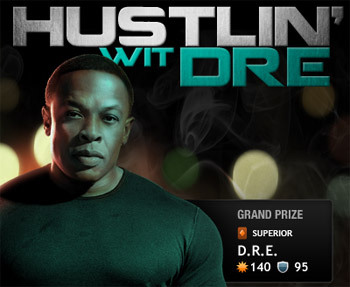 What's more, by mastering Dre's items, players can earn the chance to win a signed copy of the Detox album, as well as official Dr. Dre headphones. Interscope-Geffen's Jimmy Iovine said that the label was always looking for new ways to get music in front of people, and for an artist with Dre's cultural significance, it was important to do something new and exciting, that no one had done before. Zynga founder Mark Pincus described Dre as a "cultural icon" and thought that players would love discovering his music via Mafia Wars. This won't be the first time that Zynga has signed a deal with a high-profile hip hop artist to promote Mafia Wars. Earlier in the year, Snoop Dogg and Zynga got together to blow up an armored car in the desert to promote Mafia Wars Las Vegas. Zynga broadcast the event online, and got viewing figures that rivaled primetime television.